Our students love to have some choice over what they read as part of the Language Arts program. Book Clubs are one way to encourage reading and discussions-just like adults do. Students read for enjoyment and then talk about what they have read and recommend books to others. As teachers we often think we need to assess everything, but we rarely assess Book Clubs. While students are working in Book Clubs, we are still explicitly teaching eating to another small group, so for this reason we often arrange our Book Clubs by reading level, but it is not necessary. At the beginning of the year we often choose the book for each club. We try to make the book match their independent reading level so the books can be read comfortably by all members of the group. Later in the year, we often let groups pick their book from a small selection of books. The purpose of the club is to read, discuss, share and then read some more. 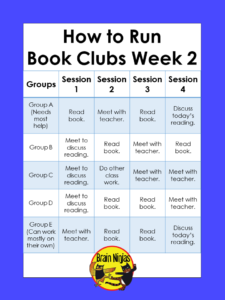 When students are first learning to be in Book Club, they will need some guidance about how much of the book they will need to read by each discussion point. Depending on the book, this could be a chapter or two between each discussion. Keep in mind you can have your students working on anything you want (including other subject areas) while you’re meeting with students. When the group is meeting with the teacher, we are doing some explicit reading instruction or word work. Each session runs about 20-30 minutes and while we try to run all the sessions back to back, sometimes we break up the sessions over two days or during different parts of the day. Some groups do better if there is a leader or moderator. This can be someone who can just help make sure everyone gets a turn or keeps track of the amount of time. Groups can also inform the teacher where they are in the novel so the teacher can intervene for pacing if needed. Most of our Book Clubs take place over the course of a month. This allows for time to read, discuss and share in class during our Language Arts time. Book Clubs take practice, but they can be very rewarding for students who just want to read. Save the guided instruction for the small group instruction while the Book Clubs manage themselves. We do not formally assess the work done in Book Clubs. 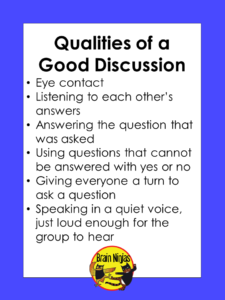 Sometimes we eavesdrop on discussions and sometimes we invite the Book Club to host their discussion with us as part do the group. Looking for another way to run a Book Club? Check out our post on using Google Hangouts to run Book Clubs.